This sweeping book is a systematic treatment of the historic transformation of the West from limited monarchy to unlimited democracy. Revisionist in nature, it reaches the conclusion that monarchy, with all its failings, is a lesser evil than mass democracy, but outlines deficiencies in both as systems of guarding liberty. By focusing on this transformation from private to public government, the author is able to interpret many historical phenomena, such as rising levels of crime, degeneration of standards of conduct and morality, the decline in security and freedom, and the growth of the mega-state. In addition, Hoppe deconstructs the classical liberal belief in the possibility of limited government and calls for an alignment of anti-statist conservatism and libertarianism as natural allies with common goals. He defends the proper role of the production of defense as undertaken by insurance companies on a free market, and describes the emergence of private law among competing insurers. The author goes on to assess the prospects for achieving a natural order of liberty. Informed by his analysis of the radical deficiencies of social democracy, and armed with the social theory of legitimation, he forsees secession as the likely future of the US and Europe, resulting in a multitude of region and city-states. 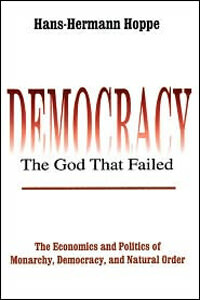 Democracy-The God that Failed ( is a brilliant and unflinching work that will be of intense interest to scholars and students of history, political economy, and political philosophy. A must-read for the individual who wants to shed the State sponsored propaganda goggles. It was so refreshing to read a work utilizing axiomatic-deductive methodology. The Statists’ only retort to this work will be more of the same; emotional illogical drivel. That being said, this work should come with the following warning label:  “After reading this work you will never look at your respective government in the same light again.”  You may not jump on the Anarcho-capitalism train, but you will most assuredly jump off the social democracy train. Thank you Dr. Hoppe for a fascinating, timeless, thought provoking, and intellectually stimulating read. If there was one book I thought everyone should read it would be Rothbard's "The Ethics of Liberty", if there were two books I thought everyone should read it would be the fore mentioned and "Democracy: the God that failed". I have had friends of mine read this book and they have all agreed it vastly changed their perspective. from Ogden, UT Brilliant and Historical!!! There are few books out there that have forever and substantially impacted my life. Democracy - The God that Failed is one of them. The concept that the world's movement from monarchy to democracy after 1917 was a movement towards de-civilization seemed at first absurd. I bought the book out of intellectual curiosity. But page after page the theory became evident and my eyes opened wider. I'm certain my wife got sick of me incessantly quoting from the book. In the end I had a major shift in perspective. Hoppe's trenchant arguments melted false ideas that I believed in since I was a child and it felt great. Everyone must read this (don't forget the footnotes). The title says it all, and is intriguing enough for inspiration to read. Hoppe builds his case, stone by stone with treatises familiar to many who may have read articles on LRC, and compiled in such a way as to comport meaning with understanding. The footnotes alone are almost a book within themselves and amplify the text in such as way as to drive home the point with a sledge hammer. Democracy, long touted as the ONLY fair representative government actually pillages it's citizens with a rapaciousness seen in the worst communist countries, through short time preferences and its open ended entry into legalized theft, extortion, and fencing of stolen goods, of the labor of its countrymen. I have been a fan of Hans-Hermann for some years now and highly recommend this for any would be student of the workings of democratic governments in the 20th century. The Mises Institute is very pleased to make available this hugely important work by the Israeli historian Martin van Creveld.